Time for another visit with Tropical Traditions. Next up for review is their Household Traditions Powdered Laundry Detergent, a honking big tub (5 pounds) of laundry magic waiting to happen. I've been alternating this detergent with my regular detergent for over a month, and I've barely put a dent in the container. It's highly concentrated, so a little goes a long way. What are the ingredients in Household Traditions Powdered Laundry Detergent? 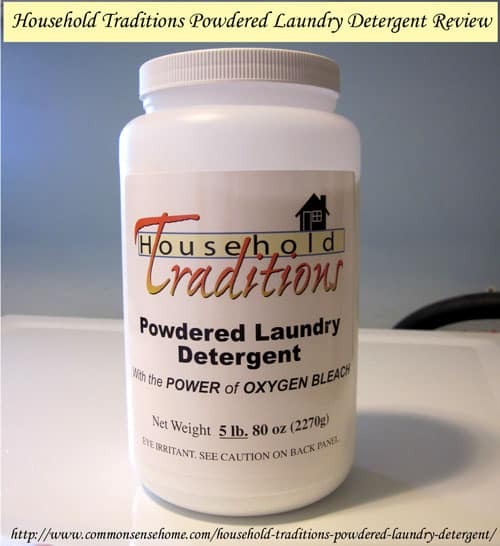 Household Traditions Powdered Laundry Detergent contains: Soda ash, sodium percarbonate, mild surfactants. How well does Household Traditions Powdered Laundry Detergent work? I've got somewhat mixed reviews on this product for my washing machine. Rinses clean – no residue left on clothes. Doesn't leave a scent behind. Does not produce lots of suds, which can be an issue with high efficiency washers. The only real problem I've run into is that the detergent does not dissolve fully in the detergent dispenser. I've got a Whirlpool Duet front loader with a pull out detergent dispenser at the top left. Sometimes after a wash, I find clumped detergent in the dispenser. I talked with someone at Tropical Traditions, and they said it is rated for use with high efficiency washers. With their machine (a top loader), they sprinkle the detergent in before the clothes go in, and this works well. I've tried sprinkling the detergent in with the clothes, and it does dissolve this way, but it's a little awkward to use. I think I'd prefer the liquid detergent. Are there toxic chemicals in your laundry products? “I was surprised by both the number and the potential toxicity of the chemicals that were found,” Steinemann said. Chemicals included acetone, the active ingredient in paint thinner and nail-polish remover; limonene, a molecule with a citrus scent; and acetaldehyde, chloromethane and 1,4-dioxane. “Nearly 100 volatile organic compounds were emitted from these six products, and none were listed on any product label. Plus, five of the six products emitted one or more carcinogenic ‘hazardous air pollutants,' which are considered by the Environmental Protection Agency to have no safe exposure level,” Steinemann said. That “lemon fresh scent” could literally be making you sick. These chemicals are particularly problematic for those with asthma or other breathing issues. You can view Material Safety Data Sheets online at the SIRI MSDS Index to check for product toxicity. On a related note, I found out this weekend that triclosan, the antibacterial agent used in many soaps, sanitizers and personal care products, breaks down into a form of dioxin in the environment. It makes me wonder if our urge to chemically sanitize is yet another contributor to the rising number of cancer cases and auto-immune disorders. See Dioxin Photoproducts of Triclosan and Its Chlorinated Derivatives in Sediment Cores, Products Containing Triclosan and Health Effects of Dioxins. You can win your own 5 pound container of Household Traditions Powdered Laundry Detergent, retail value $30.00. To enter, just subscribe to the Tropical Traditions newsletter. Additional entries can be earned by following Tropical Traditions and Common Sense Home via other social media (see rafflecopter widget for details – if you are reading via subscription, please visit the site to enter). The giveaway ends at 12:01 am central time on July 11, 2013. Must be over 18 years of age to enter. Open to residents of the US and Canada. Tropical Traditions also carries other varieties of affordable high quality coconut oil. Visit their website to check on current sales, to learn about the many uses of coconut oil, and to read about all the advantages of buying coconut oil online. Since the FDA does not want us to discuss the health benefits of coconut oil on a page where it is being sold or given away, here is the best website to read about the health benefits of coconut oil. Note: If you order by clicking on any of my links and have never ordered from Tropical Traditions in the past, you will receive a free book on Virgin Coconut Oil, and I will receive a discount coupon for referring you. We are babystepping our way to more natural products. I haven’t made the switch in our dish soap yet (or the adult shampoo) and am hoping to figure that out soon. I need to look at the ingredients in our laundry soap, we use Charlie’s Soap, but while using cloth diapers I need to use what works and so many homemade and natural ones don’t work or cause issues with leaks and such. If it leaves no scent, this is the product for me! I’ve only used their Gold Label oil but I love it! I’m interested in learning more about the various coconut products they carry. I would love to try this and their coconut oil. I’d like to try their raw honey. Why does an environmentally correct laundry product get packaged in plastic? The soap is packaged in #2 plastic, which is easily recycled pretty much everywhere. The plastic is light, reducing the use of fuel for transport. It is waterproof, protecting the product and giving it a very long shelf life. This is a bulk, concentrated product that will likely last the average family many months, meaning less packaging overall. Thanks for the chance to win…. I recently won one of their dish washing soaps and it is amazing!!!! We have EXTREMELY lard water here and it’s the first soap that doesn’t leave a white film on the dishes. Worth every penny !!!! Thanks for sharing your experience, Carol. Great products from Traditions – I would love to try their laundry cleaning products. Think I would prefer liquid, but truly, I can use either product. This is the next step on my path to learning more about detoxifying my household. Thank you. Love TT products! & curious to try this one. We have tried several different natural and homemade laundry cleaners and would love to try this detergent! I’ve tried many of TT’s products and I really like some of them. But their laundry detergent isn’t one of my favorites. I do get white residue left on my clothes etc. Sometimes I have to do a second rinse. Also, one of my big tests are if pillowcases or pajamas come out smelling like they did going in the wash. (like sweat) And they do with this detergent which makes me feel that it is not getting my laundry clean. I still have some to use up so I actually spray some of their all purpose cleaner (which I do really like) in the wash with it and that seems to work better. I also use the oxygen cleaner (like Oxyclean, I guess) sometimes with it. Not sure if that really does anything or not. So, for what it’s worth, that’s my experience with their laundry detergent. Thanks for your honest review. I prefer a more natural detergent, but not at the expense of my clothes still smelling. I have been using Norwex for a few weeks. So far, no smelly clothes. I would really like to try the laundry detergent. My family has very sensitive skin and I am always searching for bulk (I love the convenience of bulk) products that do not cause a rash. Thank you for the opportunity to learn about a new product and a chance to win it. I can’t wait to read more on your blog as I’m getting ready to start my homestead adventure. I would love to try out any of TT’s products! I have yet to try their laundry detergents, but I am definitely interested in them as I am trying to go as green and organic as I possibly can in my home! I am just now seeing this review and I was wondering, do you still use this detergent and if so, how do you feel about it now? I am thinking of switching from young living. I do still use it from time to time when I’m putting in an order with Tropical Traditions. It works as well or better than other natural laundry detergents I’ve tried over the years.